Vascular lesions of the head and neck encompass a wide range of different lesions. Historically, these lesions have been poorly understood, and their nomenclature reflects this. Over the years, this nomenclature has evolved as progress has been made in our understanding of the histopathology, clinical behavior, treatment, and prognosis of these lesions. The first tangible steps toward better defining these lesions and tailoring the treatment were made in the early 1980s. In 1982, Mulliken and Glowacki developed the first binary system of diagnosis based on histological characteristics, dividing these lesions into either hemangiomas or vascular malformations. Since that time, our understanding of the histologic composition and clinical behavior of these lesions has continued to progress and additional subclassifications have been created (see the image below). 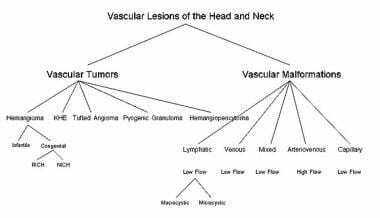 Classification of vascular lesions of the head and neck. In addition, an international collaborative has been established to further refine the diagnosis and treatment of these lesions, the International Society for the Study of Vascular Anomalies (ISSVA). Treatment and prognosis vary considerably based on the correct diagnosis of the lesion, and new modalities are being described. Our understanding of the molecular biology and genetics of these lesions is evolving at a rapid pace and additional refinement of definitions and classifications is inevitable. The purpose of this article is to examine some of the more common lesions within the current ISSVA classification system, focusing on the presentation and physiology of the specific lesions and their individualized treatment and prognosis. Current evaluation and treatment of these lesions in the pediatric population is often carried out in a multidisciplinary setting with a team of health care providers, including pediatric surgeons, head and neck surgeons, interventional radiologists, dermatologists, hematologists, and plastic surgeons. In this setting, a diagnosis is reached and a treatment plan created, streamlining a process that often requires multiple clinic visits and treatments over years and has historically been time consuming and inefficient for patients and their families. The current classification system adopted by the international medical community divides vascular lesions of the head and neck in vascular tumors and vascular malformations. This division most often occurs through careful examination of a lesion’s clinical appearance and biologic behavior. Radiographic investigation is often used in the diagnostic process, especially to aid in differentiating deep vascular tumors from deep vascular malformations and defining extent of the lesions and involvement of nearby structures. Histopathology via open or needle biopsy is rarely needed as an aid to diagnosis but should be performed in cases of lesions that behave in atypical, aggressive fashion. Ultrasound and magnetic resonance imaging (MRI) are the most commonly used radiographic techniques. On ultrasound, infantile hemangiomas (the most common type of vascular tumor) appear as hypoechoic, heterogenous, well-defined lesions. They contain small cystic and sinusoidal elements. Doppler ultrasound often reveals fast flow, while hemangiomas are in their proliferative phase. Ultrasound of vascular malformations depends upon the type of lesion. Some exhibit small cystic spaces with minimal or no flow (microcystic lymphatic malformations). Others exhibit high flow through enlarged, ectatic vascular channels (arteriovenous malformations). Still other lesions, such as macrocystic lymphatic malformations or venous malformations, exhibit low or no flow within larger cystic spaces. Three-dimensional CT angiogram of a submental vascular lesion (arrow). Vascular tumors include hemangiomas, kaposiform hemangioendothelioma (KHE), tufted angiomas (TA), pyogenic granulomas, hemangiopericytomas, and other rare lesions. These lesions have distinct histopathology and clinical behavior. The most common vascular tumor by far and the best understood is the hemangioma, of which the infantile subtype is the most common. Table 1 compares and contrasts characteristics of this most common vascular tumor with those of vascular malformations. Vascular malformations are congenital malformations of capillaries, veins, lymphatic vessels, or arteries. They may also exist as a combination of different types of vessels (eg, the arteriovenous malformation). These malformations may further be divided into high-flow or low-flow lesions based on the vessel type. The lymphatic lesions may be further divided into macrocystic and microcystic based on the size of the cystic components within the lesion. Vascular malformations grow in proportion with the patient but can exhibit rapid growth or expansion following infection, trauma, or hormonal change (eg, puberty or pregnancy). 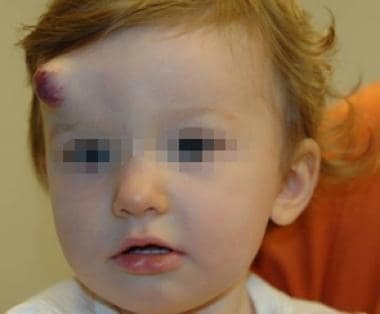 Hemangiomas represent the most common tumor in infants, occurring in up to 3-5% of all children. Most hemangiomas affect the head and neck. They are more common in females by a ratio of 3:1 and usually manifest as an isolated, dark lesion of the skin within a few weeks to months of birth. These lesions are classified as infantile hemangiomas. While subtle at birth, they reveal themselves during proliferation. In addition to being more common in females, they are more common in whites and have up to 10% incidence in preterm infants. One in 5 children affected develop more than one infantile hemangioma. Other hemangiomas present at birth are already mature and do not proliferate. These are referred to as congenital hemangiomas and are divided into rapidly involuting congenital hemangiomas (RICHs) and noninvoluting congenital hemangiomas (NICHs). [5, 6] Most cases of RICH involute entirely by age 1 year. NICHs do not decrease in size. Congenital hemangiomas account for approximately 3% of all hemangiomas. Infantile hemangiomas are the focus of this section of the article. The proliferative phase is followed by a prolonged phase of involution. Involution may last many years. A clinical pearl exists that complete involution occurs in 50% of lesions by age 5 years and in 70% of lesions by age 7 years. Involution leaves an area of expanded skin or mucosa (depending upon the location of the lesion) and loss of underlying normal subcutaneous fat and replacement with fibrofatty tissue. In addition, bone erosion or remodeling may have occurred due to the presence of the lesion. Infantile hemangiomas usually present within the first few weeks to months of birth. The symptoms and signs are dependent upon the location and depth of the lesion. Superficial lesions that affect the skin manifest as raised, red lesions that are somewhat firm to the touch (see the first image below). Subcutaneous lesions tend to manifest as deeper masses with a blue hue and an unaffected overlying skin layer (see the second image below). These deeper lesions are more difficult to differentiate from vascular malformations and other masses and more often require radiographic imaging to aid in diagnosis. Hemangiomas may also contain both superficial and deep elements (see the third image below). Combined superficial and deep infantile hemangioma. The natural history of infantile hemangiomas is one of growth followed by involution. Complications occur at various points in this history and may be systemic or limited to the site of the lesion. Complications also occur as a result of intervention, both medical and surgical. Local complications are many and are dependent largely upon the size and location of the lesion. 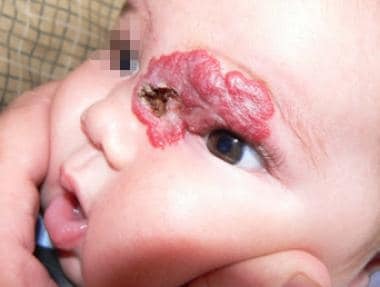 Ulceration and infection occur commonly during the proliferative phase of superficial skin infantile hemangiomas, although one goal of early treatment is to avoid ulceration. [4, 12] The first-line treatment for both of these conditions is improved wound hygiene and topical antibiotic ointment. Laser therapy with the pulse dye laser may also be used early on for ulceration. Larger skin breakdown or infection may require intravenous antibiotics and/or systemic medical management (see the image below). Scarring may occur as a natural consequence of hemangioma involution or as an outcome of ulceration. Small hemangiomas in nonvital locations may be managed with observation, but the deformity after involution may be unsightly and require surgical revision. Some lesions can cause significant aesthetic concerns that warrant treatment rather than observation. These lesions can be managed medically, surgically, or with laser treatment. These modalities may also be used in combination. 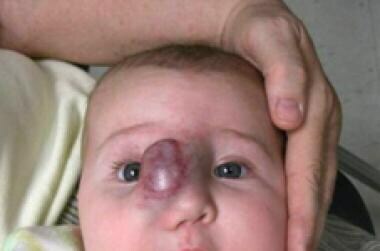 Periorbital infantile hemangioma that is compromising vision. Airway compromise is a local complication of subglottic hemangiomas. Prior to propranolol, approximately one half of all subglottic hemangiomas require surgical intervention in addition to any medical management. Untreated airway compromise may prove fatal. Tracheotomy, one of the surgical management techniques, has its own morbidity and mortality as well. Hemangiomas involving the parotid gland may also obstruct the airway, albeit at a higher level. Deep vascular tumor with overlying skin discoloration in a 2-week-old infant with thrombocytopenia. T2-weighted MRI of the infant in the image above demonstrating depth, infiltrative characteristics, and enhancement on T2-weighted imaging in this lesion, eventually proven to be kaposiform hemangioendothelioma (KHE). Congestive heart failure may occur in the setting of large and/or multiple hemangiomas located in the skin, subcutaneous tissues, or viscera. This complication is also associated with kaposiform hemangioendotheliomas and tufted angiomas. This complication may be due to years of wear and tear on the heart caused by moving blood rapidly through an additional large, high flow circuit. Large, deep, or visceral hemangiomas can be difficult to detect upon physical examination. A high index of suspicion should be maintained for difficult to detect lesions and for heart failure in patients with multiple hemangiomas or with a KHE or TA. Because the liver is the most common site of involvement,  abdominal ultrasound may prove diagnostic and is recommended in patients with KHE, TA, or multiple hemangiomas as a screening tool. Patients with congestive heart failure may require intensive medical management. Because hemangiomas may occur anywhere, as single or multiple lesions, as superficial or deep visceral lesions, treatment varies considerably in method and timing. The physician should remember that observation may be a suitable for certain lesions. Some lesions are better dealt with once they have involuted, or they may turn out to require no pharmacotherapy or surgery whatsoever. Treatment is indicated when functional or cosmetic complications arise (or are predicted to arise) that are worse than the side effects of intervention. Lesion size, location, patient age, and phase of the lesion (proliferative, involuting, mature) also influence the method and timing of intervention. One benefit of propranolol over systemic steroids is that the effects can be lasting after discontinuation of propranolol, while with steroids the lesion can quickly proliferate again after discontinuing treatment if still in the proliferative phase. The exact mechanism of how the beta-blocker causes regression in infantile hemangiomas has not been proven, but it may act by down-regulating factors that enhance endothelial growth and/or by triggering apoptosis of endothelial cells within the lesion. Studies have shown greater than 80% response. [4, 22] The images below show before and after treatment with propranolol. Large hemangioma of infancy before propranolol treatment. The same large hemangioma of infancy as in the previous image after just 1 week of propranolol treatment. Prior to propranolol, corticosteroids were the first-line medical therapeutic intervention for hemangiomas in the proliferative and involution phases. Steroids do continue to play an integral role in the treatment but are often not the first-line treatment anymore. Results have been published supporting the use of topical steroids in infantile hemangioma. Steroids may also be given intralesionally, especially in the case of localized lesions. For instance, small yet problematic subglottic hemangiomas may be managed with repeated submucosal injections. This method is often combined with other endoscopic interventions and may require postoperative intubation secondary to swelling after injection. The mechanism of steroid therapy in hemangioma treatment is unknown. Steroids also have a long list of potential side effects, especially when used for the lengths of time often required by the hemangioma. Patients treated with systemic oral steroids should be monitored for hypertension, weight loss or gain, growth retardation, and suppression of the adrenal axis. Adrenal suppression and failure to thrive have also been reported following local injection of steroids. In addition, the possible development of gastritis necessitates prophylactic histamine-2 receptor blocker or proton pump inhibitor therapy. Immune suppression may occur as well, and some have suggested that patients not receive live virus vaccine and potentially receive antibiotic prophylaxis against pneumocystis carinii and atypical mycobacterium. Interferon has an antiangiogenic effect and decreases the rate of endothelial proliferation. It was historically used in the treatment of aggressive hemangiomas, often as an adjunct to steroids. Response often requires weeks to months of therapy. The long list of side effects for this medication includes spastic diplegia, a potentially irreversible neurological condition. For this reason, other adjuncts are often used in place of interferon. Multiple lasers have been employed in the treatment of infantile hemangiomas. The pulsed-dye laser (PDL) is a commonly used laser in the treatment of vascular lesions; however, controversy exists regarding its use in hemangiomas. Evidence exists supporting the use of the PDL in ulcerated lesions. [35, 36] The carbon dioxide (CO2) laser has been used extensively in the treatment of subglottic hemangiomas. In a large review of these particular lesions, CO2 laser was the most extensively used modality and had a complication rate of about 12%, most notably subglottic stenosis. Diode lasers such as the Nd:YAG have also been used. Not all lesions fitting these criteria require removal, nor will all lesions excised meet these criteria perfectly. In addition, the timing of surgery is often controversial. Parents may wish to have a lesion excised that the treating physician believes will involute completely or at least be easier to excise at a later date. The risks of the procedure must be weighed against the predicted benefits of a more conservative management. The treatment of these unique lesions deserves special mention, principally because of the number of options and the amount of controversy present. Treatment includes such varied options as observation, tracheotomy, and waiting for involution, medical management, endoscopic techniques (laser, microdebrider, steroid injection), and open excision. Smaller lesions that are relatively asymptomatic may be observed or treated medically with propranolol or oral steroids. Symptomatic lesions are often treated with both propranolol and steroids, if not endoscopic laser treatment. Subglottic hemangioma prior to open excision. Subglottic hemangioma after open excision. Vascular malformations are congenital malformations of capillaries, veins, lymphatics, or arteries, alone or in combination. These lesions are not characterized by endothelial proliferation or involution. Instead, they are characterized by proportional growth and possible rapid growth in the setting of trauma, infection, or hormonal change. Vascular malformations are congenital, meaning that they are present at birth. Most are diagnosed during infancy, although some are noticed later in childhood, as in the case of a lymphatic malformation that presents after viral upper respiratory infection. These lesions may also be distinguished by the rate of flow and size of lymphatic cystic components, as seen in the image below. Diagnosis is often accomplished by a thorough history and physical examination. The age at which the lesion was noticed (congenital), its lack of proliferative growth, subtle color distinction from normal tissue, and compressibility all hint at the diagnosis of vascular malformation. If the lesion has grown rapidly, investigating precipitating events such as upper respiratory tract illness or local trauma is useful. Palpating for a thrill or pulsation and to auscultate for a bruit is also useful. After history and physical examination, radiological investigation is often the next step in distinguishing vascular malformations from vascular tumors and in mapping the extent of the lesion. 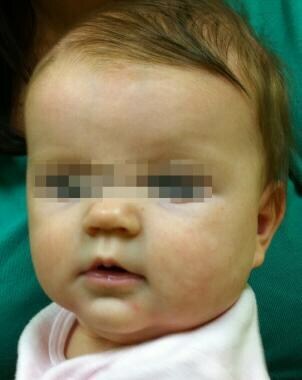 Capillary malformations of the head and neck region usually present at birth as a pink macular lesion and can occur in the distribution of the trigeminal nerve. These may fade or darken as the child ages. Certain capillary malformations manifest at birth that do not fade are known as port wine stains. These are dark red, raised lesions that persist throughout the individual’s life. 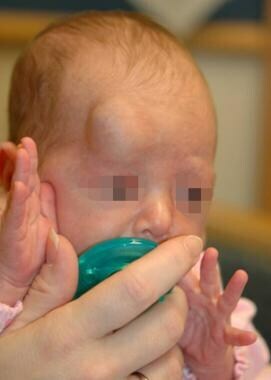 Many capillary malformations are slightly rubbery upon palpation. Sturge-Weber syndrome deserves special mention in any discussion of capillary malformations. Port wine stains in the distribution of the first division (V1) or second division (V2) of the trigeminal nerve are a characteristic of this rare autosomal dominant condition. Certain subtypes of this condition are associated with central nervous system vascular lesions (such as leptomeningeal capillary malformations, venous malformations, or AVMs) as well as with lesions of the eye, including glaucoma. These children may have seizures and learning or behavior difficulties. 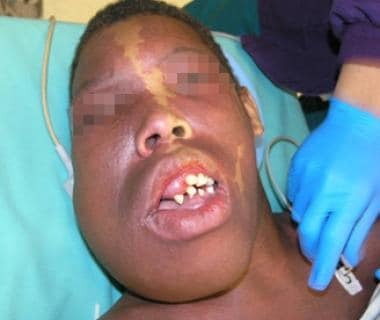 Patients with capillary malformations of the face warrant an investigation for Sturge-Weber syndrome, including imaging of the brain and ophthalmologic investigation. Patients suspected of having Sturge-Weber syndrome should be referred to both a neurologist and ophthalmologist. Klippel-Trenaunay-Weber syndrome also is associated with port wine stains, venous malformations, and hypertrophy of the associated limb. Several other genetic conditions are associated with capillary malformations, including hereditary hemorrhagic telangiectasia (HHT) and ataxia-telangiectasia. HHT is associated with mucosal and visceral lesions that bleed easily. Ataxia-telangiectasia is associated with central nervous system dysfunction, cutaneous telangiectasia, and immune compromise. Despite these genetic conditions and their unusual manifestations, the most common complications of capillary malformations are cosmetic. Laser therapy is the most common intervention for the routine capillary malformation. Of the available laser, the PDL is the most widely used. The PDL’s wavelength allows the energy to be absorbed by hemoglobin within the lesion rather than overlying and surrounding normal tissue and has a 50-70% response rate. The Nd:YAG laser has found application in the treatment of the mucosal lesions of HHT. Venous malformations are present in 1-4% of the population. They may be in the epidermis/dermis or within muscle or bone. Histologically, these lesions are composed of ectatic, poorly organized venous channels that have normal endothelium and lack the normal smooth muscle architecture that usually surrounds veins. Instead, muscle cells are arranged in unorganized fashion. Venous malformations are low-flow lesions. Venous malformations are present at birth, although not all are clinically evident. They are the most common type of vascular malformation. Most are asymptomatic swellings that have a blueish hue, are compressible and not pulsatile, and have no palpable thrill or audible bruit. Some lesions have palpable phleboliths within them, a diagnostic hallmark of the venous malformation. If located in the head and neck, some lesions increase in size with compression of the ipsilateral jugular vein. Valsalva maneuver may also increase the size of the lesion, as will any high cardiac output state. The most common locations for involvement in the head and neck are the masseter muscle, skin, lips/oral mucosa, and mandible. Mandibular lesions may present with loosening of teeth or bleeding. Lesions may also occur in the orbit, causing exophthalmos and vision changes. The images below show striking venous malformation of the head and neck that is after multiple resections and embolizations. Venous malformation of the head and neck in an adolescent. 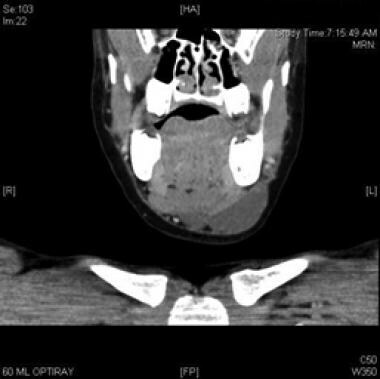 Intraoral component of venous malformation in the same patient in the image above. Sagittal fat-suppressed T1 postcontrast MRI of venous malformation in the same patient in the 2 images above. Venous malformations can cause a multitude of complications. Even small lesions may be painful. This is likely secondary to phlebolith formation. Lesions may also become infected, as can any clots that form in the abnormal vascular channels. Cosmetic problems can occur with large lesions that cause contour abnormalities of the soft tissues and bony skeleton of the face and neck. If the lesion is small and symptoms are absent or minimal, reassurance and observation are likely the best treatment. For lesions that warrant a higher degree of intervention, there are essentially 2 modalities, both of which are frequently used in combination: sclerotherapy and surgical excision. Surgical excision of limited lesions is sometimes an excellent choice for initial treatment. Sclerotherapy may also be used as a single modality for small lesions. Unfortunately, many venous malformations of the head and neck infiltrate many tissue planes and are intimately associated with vital nerves and vessels. For this reason, surgical excision is often used as a debulking procedure after sclerotherapy. To date no prospective trials have compared the various sclerosing agents. The most commonly used sclerosing agents for venous malformations are ethanol and sodium tetradecyl sulfate STS), although doxycycline is another agent used. [17, 42, 43] These agents are injected directly into the lesions, often with ultrasound, fluoroscopic, or MRI guidance and often in multiple settings because the malformations are large and have a propensity to recanalize. Reports have been published on the safe and effective use of ethanol for the treatment of venous malformations. [42, 44] Ethanol is inexpensive and easy to administer. However, it is painful and requires general anesthesia. To enhance exposure of the lesion’s endothelium to the ethanol, limitation of venous outflow may be required (manual or rubber-band compression). Complications of ethanol sclerotherapy include pain, skin necrosis, transient neuropathy, bleeding, renal toxicity, cardiac arrest, and anaphylaxis. [44, 45] STS has a lower incidence of serious side effects when compared with ethanol but may be less effective as well. Bleomycin is a newer agent that has been used for sclerotherapy. As with other vascular malformations, lymphatic malformations are present at birth and lined by nonproliferating endothelium. More than 50% are recognized at birth and 90% by age 2 years. They may occur anywhere in the body, although the head and neck region is most commonly affected. Lymphatic malformations are low-flow lesions and may exist as combinations of lymphatic and venous vessels, in which case they are termed venous-lymphatic malformations. Older literature refers to lymphatic malformations by names such as "cystic hygroma" and "lymphangioma." These terms should be abandoned because they imply tumor characteristics that these lesions do not possess. Lymphatic malformations usually grow commensurate with the patient but may rapidly expand secondary to infection, trauma, or hormonal disturbance. Microcystic lymphatic malformations are composed of clear vesicles within the subcutaneous tissue and muscles. These small cystic structures coalesce to form somewhat firm lesions that infiltrate the surrounding normal tissues. These lesions most commonly occur superior to the mylohyoid muscle, in the oral cavity for example (see the image below). Macrocystic lesions are more often softer and more easily compressed. They commonly appear underneath blueish discolored skin and as translucent swellings when exposed surgically. They are usually less infiltrative into surrounding normal tissue. 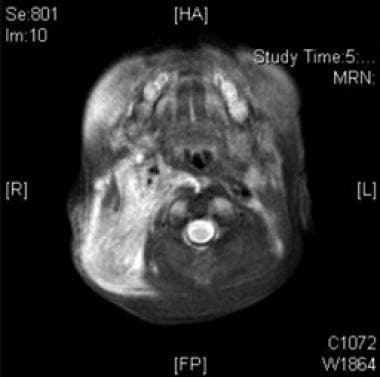 All patients with lymphatic malformations of the head and neck should have imaging of the lesion and, should the lesion be present in the lower neck, of the chest as well to evaluate for thoracic involvement. Microcystic lymphatic malformation of the tongue and floor of mouth. Large lymphatic malformations are often noticed in utero during routine ultrasound. These lesions may be further defined by MRI, usually in the second trimester. Microcystic lesions appear as isodense and infiltrative lesions. Macrocystic lesions have ringlike margin enhancement and are sharply demarcated from the surrounding normal tissue. With large lesions noticed in utero, airway compromise is of concern. These patients and their mothers may require nonroutine delivery location and method. Ex utero intrapartum treatment (EXIT procedure) may be necessary to control the patient’s airway during delivery. In this procedure, the patient is partially delivered from the uterus and maintained on placental circulation until definitive airway management is achieved. Interventions range from simple laryngoscopy and intubation, flexible or rigid bronchoscopy and intubation, to a surgical airway (tracheotomy). Many possible complications may arise from lymphatic malformations, including airway compromise, infection, and disfigurement. Airway compromise may occur at birth secondary to obstruction from the mass effect of the lesion. In addition, airway compromise may occur when the lesion rapidly enlarges, as occurs in the setting of infection, trauma, or hormonal disturbance. Large lesions may cause secondary disturbances in bone and soft tissue growth, leading to disfigurement. Complications may also occur secondary to treatment. Surgical excision is associated with scar tissue both internally and within the skin, in addition to placing often intimately involved vessels and nerves at risk. Sclerotherapy is associated with post-treatment swelling, which may compromise the airway and/or swallowing, requiring intervention. For this reason (and because significant pain is associated with the procedure), sclerotherapy is often performed in the hospital under general anesthesia, and patients are usually observed for swelling and respiratory compromise for 24 hours. The ideal treatment strategy for lymphatic malformations depends upon numerous factors, including the location of the lesion and its extent of infiltration into normal tissues, whether it is microcystic or macrocystic, and the complications encountered or predicted for that particular lesion. As with vascular malformations, essentially 2 major treatment strategies exist other than observation: surgical excision and sclerotherapy. Surgical excision is an ideal treatment for those lesions that are amenable. Previously untreated macrocystic lesions are the best candidates for this approach. They are often lower in the neck (below the mylohyoid muscle), less infiltrative, and easier to follow through tissue planes surgically when compared with their microcystic counterparts. However, they may be intimately involved with neurovascular structures within the neck (see the images below). Axial CT with contrast of macrocystic lymphatic malformation inferior to mylohyoid muscle. Coronal CT scan with contrast of macrocystic lymphatic malformation inferior to mylohyoid muscle. Sagittal CT with contrast of macrocystic lymphatic malformation inferior to mylohyoid muscle. Intraoperative view of macrocystic lymphatic malformation. The digastric muscle is visible in the center of the wound. Intraoperative view of macrocystic lymphatic malformation. Surgical excision is also the treatment of choice for microcystic lesions, because these are more challenging if not impossible to treat with sclerotherapy. In these cases, limited excision is often the rule because the lesions are more infiltrative, lack distinct planes separating them from normal tissue, and are often too involved with vital structures to permit complete excision. CO2 and Nd:YAG lasers have been used to facilitate limited excision of these difficult lesions. Sclerotherapy is an excellent treatment choice for macrocystic lesions, the removal of which jeopardizes vital structures, or for patients who are poor surgical candidates. Although not "curative" in that the lesion is not removed, most patients achieve a 50% or greater reduction in the size of the lesion. In a large review of the literature on sclerotherapy, Acevedo et al found that 87.5% of patients had some amount of positive response to sclerotherapy and only 12.5% went on to require subsequent surgery. These authors conclude that sclerotherapy may be an appropriate first-line therapy for macrocystic lymphatic malformations. Many lesions require only one treatment session, although it is not rare to repeat the session should the initial result be unsatisfactory. Numerous agents have been and are being used for sclerotherapy including ethanol, STS, bleomycin, and OK-432 (a lyophilized strain of group A Streptococcus pyogenes incubated with benzylpenicillin). OK-432 and bleomycin are the most commonly used agents. OK-432 has been shown to stay within the lymphatic channels of the lesion and is associated with less fibrosis in the surrounding normal tissues when compared with other agents. In addition, OK-432 is associated with a more favorable side effect profile than bleomycin. It’s most common side effects are pyrexia, local pain, and erythema, although major complications such as edema and airway compromise are possible. Bleomycin is associated with pulmonary toxicity in addition to swelling. Arteriovenous malformations (AVMs) are high-flow lesions that allow shunting of blood from the arterial system directly into the venous system. It is thought that they are residua from failure of primitive vascular communications to obliterate. They are rare compared with other vascular lesions. They are most commonly found in the head and neck region, especially intracranially, and are the most dangerous of all vascular lesions. Although they do not proliferate as hemangiomas do, AVMs may grow, usually secondary to the development of collateral channels for blood flow. In addition, these lesions share the ability with other vascular malformations to expand rapidly with infection, trauma, or hormonal disturbance. The diagnosis of these lesions is based on the history of physical examination, supported by ultrasound and radiography. Doppler ultrasound likely reveals ectatic vessels with high flow. MRI and MRA are often used to confirm clinical suspicion and define the extent of the lesion. MRI reveals a high-flow lesion with flow voids and diffuse enhancement with contrast. MRA reveals the tangled, ectatic nature of the lesion’s vasculature and the main feeding vessels from the normal circulation. AVMs can cause pain, expansion, and disfigurement, ulceration, life-threatening bleeding, cardiac hypertrophy, and cardiac failure secondary to sustained high cardiac output. Excessive bleeding and its associated morbidities and potential mortality may occur during resection of these lesions. Stroke is another well-known complication of intracranial AVM. Modern medicine has clearly made a great deal of progress in the diagnosis and management of vascular lesions. The treating physician is often a member of a multidisciplinary team and has at his or her fingertips treatment modalities that have resulted from genetic research, modern imaging, and evidence-based study. Nevertheless, a great deal remains to be done, especially in the case of those lesions that are difficult to treat medically and that are associated with surgical comorbidities, as in the case of subglottic hemangioma. Elluru RG, Azizkhan RG. Cervicofacial vascular anomalies. II. Vascular malformations. Semin Pediatr Surg. 2006 May. 15(2):133-9. [Medline]. Perkins JA, Sidhu M, Manning SC, Ghioni V, Sze R. Three-dimensional CT angiography imaging of vascular tumors of the head and neck. Int J Pediatr Otorhinolaryngol. 2005 Mar. 69(3):319-25. [Medline]. Holland KE, Drolet BA. Approach to the patient with an infantile hemangioma. Dermatol Clin. 2013 Apr. 31(2):289-301. [Medline]. Krol A, MacArthur CJ. Congenital hemangiomas: rapidly involuting and noninvoluting congenital hemangiomas. Arch Facial Plast Surg. 2005 Sep-Oct. 7(5):307-11. [Medline]. Berenguer B, Mulliken JB, Enjolras O, et al. Rapidly involuting congenital hemangioma: clinical and histopathologic features. Pediatr Dev Pathol. 2003 Nov-Dec. 6(6):495-510. [Medline]. Browning JC, Metry DW. 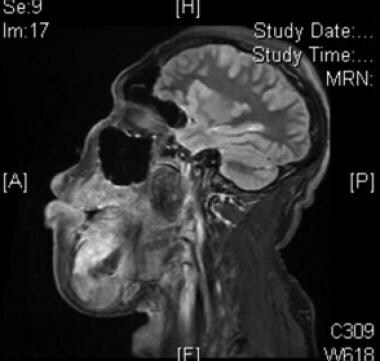 Rapidly involuting congenital hemangioma: case report and review of the literature. Dermatol Online J. 2008 Apr 15. 14(4):11. [Medline]. North PE, Waner M, Mizeracki A, Mihm MC Jr. GLUT1: a newly discovered immunohistochemical marker for juvenile hemangiomas. Hum Pathol. 2000 Jan. 31(1):11-22. [Medline]. Yanes DA, Pearson GD, Witman PM. Infantile Hemangiomas of the Lip: Patterns, Outcomes, and Implications. Pediatr Dermatol. 2016 Sep. 33 (5):511-7. [Medline]. Bitar MA, Moukarbel RV, Zalzal GH. Management of congenital subglottic hemangioma: trends and success over the past 17 years. Otolaryngol Head Neck Surg. 2005 Feb. 132(2):226-31. [Medline]. Orlow SJ, Isakoff MS, Blei F. Increased risk of symptomatic hemangiomas of the airway in association with cutaneous hemangiomas in a "beard" distribution. J Pediatr. 1997 Oct. 131(4):643-6. [Medline]. Lalwani A. Hemangiomas of Infancy and Vascular Malformations. Current Diagnosis and Treatment in Otolaryngology-Head and Neck Surgery. 3rd ed. New York, NY: McGraw-Hill; 2011. 7. Goldberg NS, Rosanova MA. Periorbital hemangiomas. Dermatol Clin. 1992 Oct. 10(4):653-61. [Medline]. Frank RC, Cowan BJ, Harrop AR, Astle WF, McPhalen DF. Visual development in infants: visual complications of periocular haemangiomas. J Plast Reconstr Aesthet Surg. 2008 Dec 19. [Medline]. Hall GW. Kasabach-Merritt syndrome: pathogenesis and management. Br J Haematol. 2001 Mar. 112(4):851-62. [Medline]. Enjolras O, Wassef M, Mazoyer E, et al. Infants with Kasabach-Merritt syndrome do not have "true" hemangiomas. J Pediatr. 1997 Apr. 130(4):631-40. [Medline]. Rahbar R, McGill T, Mulliken J. Vascular tumors and malformations of the head and neck. Cummings Otolaryngology-Head and Neck Surgery. Philadelphia, PA: Mosby; 2005. 4013-4026. Perez Payarols J, Pardo Masferrer J, Gomez Bellvert C. Treatment of life-threatening infantile hemangiomas with vincristine. N Engl J Med. Jul 1995. 333(1):69. 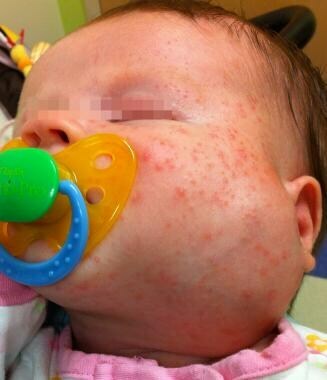 Leaute-Labreze C, Dumas de la Roque E, Hubiche T, Boralevi F, Thambo JB, Taieb A. Propranolol for severe hemangiomas of infancy. N Engl J Med. 2008 Jun 12. 358(24):2649-51. [Medline]. Parikh SR, Darrow DH, Grimmer JF, Manning SC, Richter GT, Perkins JA. Propranolol use for infantile hemangiomas: American Society of Pediatric Otolaryngology Vascular Anomalies Task Force practice patterns. JAMA Otolaryngol Head Neck Surg. 2013 Feb. 139(2):153-6. [Medline]. Brooks M. FDA OKs propranolol hydrochloride for infantile hemangioma. Medscape Medical News. Mar 17, 2014. [Full Text]. Raol N, Metry D, Edmonds J, Chandy B, Sulek M, Larrier D. Propranolol for the treatment of subglottic hemangiomas. Int J Pediatr Otorhinolaryngol. 2011 Dec. 75(12):1510-4. [Medline]. Drolet BA, Frommelt PC, Chamlin SL, Haggstrom A, Bauman NM, Chiu YE. Initiation and use of propranolol for infantile hemangioma: report of a consensus conference. Pediatrics. 2013 Jan. 131(1):128-40. [Medline]. Garzon MC, Lucky AW, Hawrot A, Frieden IJ. Ultrapotent topical corticosteroid treatment of hemangiomas of infancy. J Am Acad Dermatol. 2005 Feb. 52(2):281-6. [Medline]. Saetti R, Silvestrini M, Cutrone C, Narne S. Treatment of congenital subglottic hemangiomas: our experience compared with reports in the literature. Arch Otolaryngol Head Neck Surg. 2008 Aug. 134(8):848-51. [Medline]. Enjolras O, Riche MC, Merland JJ, Escande JP. 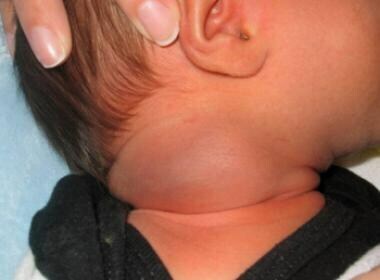 Management of alarming hemangiomas in infancy: a review of 25 cases. Pediatrics. 1990 Apr. 85(4):491-8. [Medline]. Goyal R, Watts P, Lane CM, Beck L, Gregory JW. Adrenal suppression and failure to thrive after steroid injections for periocular hemangioma. Ophthalmology. 2004 Feb. 111(2):389-95. [Medline]. Chang E, Boyd A, Nelson CC, et al. Successful treatment of infantile hemangiomas with interferon-alpha-2b. J Pediatr Hematol Oncol. 1997 May-Jun. 19(3):237-44. [Medline]. Michaud AP, Bauman NM, Burke DK, Manaligod JM, Smith RJ. Spastic diplegia and other motor disturbances in infants receiving interferon-alpha. Laryngoscope. 2004 Jul. 114(7):1231-6. [Medline]. Sato Y, Frey EE, Wicklund B, Kisker CT, Smith WL. Embolization therapy in the management of infantile hemangioma with Kasabach Merritt syndrome. Pediatr Radiol. 1987. 17(6):503-4. [Medline]. Moore J, Lee M, Garzon M, et al. Effective therapy of a vascular tumor of infancy with vincristine. J Pediatr Surg. 2001 Aug. 36(8):1273-6. [Medline]. Hu B, Lachman R, Phillips J, Peng SK, Sieger L. Kasabach-Merritt syndrome-associated kaposiform hemangioendothelioma successfully treated with cyclophosphamide, vincristine, and actinomycin D. J Pediatr Hematol Oncol. 1998 Nov-Dec. 20(6):567-9. [Medline]. Wang Z, Li K, Yao W, Dong K, Xiao X, Zheng S. Steroid-resistant kaposiform hemangioendothelioma: a retrospective study of 37 patients treated with vincristine and long-term follow-up. Pediatr Blood Cancer. 2015 Apr. 62 (4):577-80. [Medline]. Smit JM, Bauland CG, Wijnberg DS, Spauwen PH. Pulsed dye laser treatment, a review of indications and outcome based on published trials. Br J Plast Surg. 2005 Oct. 58(7):981-7. [Medline]. David LR, Malek MM, Argenta LC. Efficacy of pulse dye laser therapy for the treatment of ulcerated haemangiomas: a review of 78 patients. Br J Plast Surg. 2003 Jun. 56(4):317-27. [Medline]. Kim HJ, Colombo M, Frieden IJ. Ulcerated hemangiomas: clinical characteristics and response to therapy. J Am Acad Dermatol. 2001 Jun. 44(6):962-72. [Medline]. Daramola OO, Chun RH, Nash JJ, Drolet BA, North PE, Jensen JN, et al. Surgical treatment of infantile hemangioma in a multidisciplinary vascular anomalies clinic. Int J Pediatr Otorhinolaryngol. 2011 Oct. 75(10):1271-4. [Medline]. Bajaj Y, Hartley BE, Wyatt ME, Albert DM, Bailey CM. Subglottic haemangioma in children: experience with open surgical excision. J Laryngol Otol. 2006 Dec. 120(12):1033-7. [Medline]. Vijayasekaran S, White DR, Hartley BE, Rutter MJ, Elluru RG, Cotton RT. Open excision of subglottic hemangiomas to avoid tracheostomy. Arch Otolaryngol Head Neck Surg. 2006 Feb. 132(2):159-63. [Medline]. Mulliken JB, Fishman SJ, Burrows PE. Vascular anomalies. Curr Probl Surg. 2000 Aug. 37(8):517-84. [Medline]. Lewin JS, Merkle EM, Duerk JL, Tarr RW. 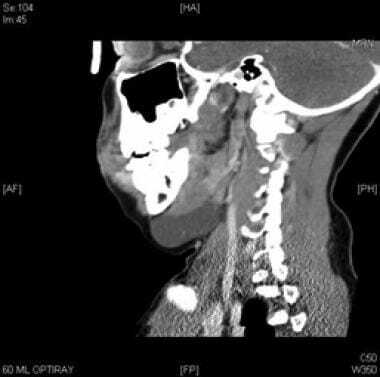 Low-flow vascular malformations in the head and neck: safety and feasibility of MR imaging-guided percutaneous sclerotherapy--preliminary experience with 14 procedures in three patients. Radiology. 1999 May. 211(2):566-70. [Medline]. Johnson PL, Eckard DA, Brecheisen MA, Girod DA, Tsue TT. Percutaneous ethanol sclerotherapy of venous malformations of the tongue. AJNR Am J Neuroradiol. 2002 May. 23(5):779-82. [Medline]. 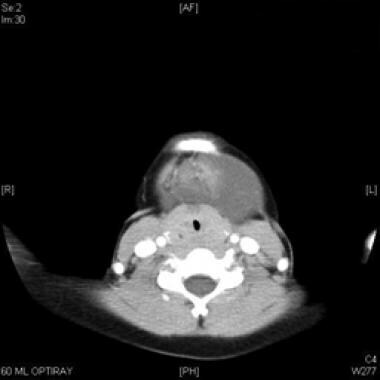 Siniluoto TM, Svendsen PA, Wikholm GM, Fogdestam I, Edstrom S. Percutaneous sclerotherapy of venous malformations of the head and neck using sodium tetradecyl sulphate (sotradecol). Scand J Plast Reconstr Surg Hand Surg. 1997 Jun. 31(2):145-50. [Medline]. Lee CH, Chen SG. Direct percutaneous ethanol instillation for treatment of venous malformation in the face and neck. Br J Plast Surg. 2005 Dec. 58(8):1073-8. [Medline]. Legiehn GM, Heran MK. Venous malformations: classification, development, diagnosis, and interventional radiologic management. Radiol Clin North Am. 2008 May. 46(3):545-97, vi. [Medline]. de Serres LM, Sie KC, Richardson MA. 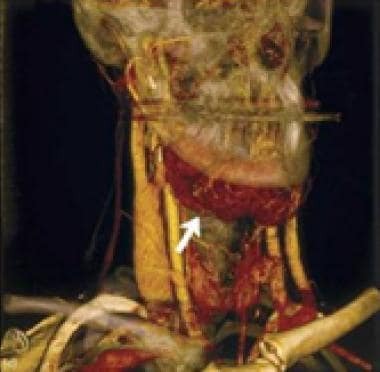 Lymphatic malformations of the head and neck. A proposal for staging. Arch Otolaryngol Head Neck Surg. 1995 May. 121(5):577-82. [Medline]. Acevedo JL, Shah RK, Brietzke SE. Nonsurgical therapies for lymphangiomas: a systematic review. Otolaryngol Head Neck Surg. 2008 Apr. 138(4):418-24. [Medline]. Peters DA, Courtemanche DJ, Heran MK, Ludemann JP, Prendiville JS. Treatment of cystic lymphatic vascular malformations with OK-432 sclerotherapy. Plast Reconstr Surg. 2006 Nov. 118(6):1441-6. [Medline]. Gilony D, Schwartz M, Shpitzer T, Feinmesser R, Kornreich L, Raveh E. Treatment of lymphatic malformations: a more conservative approach. J Pediatr Surg. 2012 Oct. 47(10):1837-42. [Medline]. Stier MF, Glick SA, Hirsch RJ. Laser treatment of pediatric vascular lesions: Port wine stains and hemangiomas. J Am Acad Dermatol. 2008 Feb. 58(2):261-85. [Medline]. Disclosure: Serve(d) as a director, officer, partner, employee, advisor, consultant or trustee for: Triple Endoscopy Inc. . The authors and editors of Medscape Reference gratefully acknowledge the contributions of previous author Jeffrey S Zapalac, MD, to the development and writing of this article.